Fat Worm of Error does not play Sunday morning latte-sipping, New York Times crossword-doing music. It plays makeout songs for the ADHD generation, dance music for aliens. The Easthampton five-piece avant-rock band's live show is part hyperactive Kabuki theater, part Cirque du Soleil on acid. The music is disjointed and disorienting. Their use of starts and stops and unconventional time signatures renders head-bobbing and toe-tapping near impossible. They make their own elaborate masks and stage costumes from found materials and Day-Glo scraps of clothing, adding yet another layer of interesting confusion. 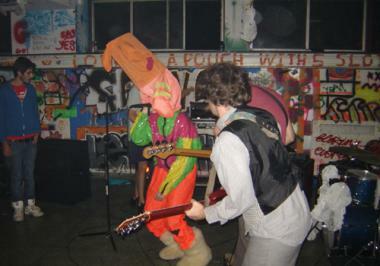 Fat Worm has toured Europe and the United States numerous times, playing house parties, art galleries and rock venues that cater to the avant-garde and the adventurous. The group's organized but chaotic sound and surreal and absurdist lyrics and vocals might distract the listener, but underneath it all lie pop songs. Well, sort of. This is, after all, a band that named its first album for venerable Providence, Rhode Island independent label Load Records Pregnant Babies Pregnant with Pregnant Babies. We spoke to Fat Worm of Error's Chris Cooper. Advocate: How did you get into making experimental music? Chris Cooper: I was always excited to hear something new. I was always afraid of metal. I always assumed that solos would be crazy, scary sounds. Then I heard a kid listening to AC/DC on the bus and I was like, "This is just distorted blues. This isn't intimidating at all!" I burned through a lot of music like that growing up. When I was a kid my family sold all their belongings and traveled around. We started in Europe and then went to Africa and Southeast Asia. The idea when we got to this place in Micronesia was to build a hut and go native. Leave the rat race, and have this sort of hippie utopia. It was harder than my parents thought. In particular, my time in Indonesia really informed my musical education. Unlike most other families, we didn't have Beatles records around and stuff. We didn't have records at all. So we came back to the States when I was 10, and I saw the inception and development of my parents' record collection. The first record we got was a Nonesuch gamelan record. That's an amazing first record to have as a kid. Yeah, that was my Beatles. What about your musical progression? Around 18 I started doing a lot of home taping and sound collage. I had heard of John Cage and [Karlheinz] Stockhausen. Now I was getting into Merzbow, and people that created music by putting this output into that input and getting a screeching sound that sounded great, and putting that cassette out. And at the same time I was doing a bunch of free improvisation as well. I consider Fat Worm a rock band, but the recordings have elements of both tape collage and improvisation. Your live show is definitely frenetic and high energy, while being somewhat orchestrated. Did that evolve over time? We thought about being just an improv noise band. And then we decided to play rock instrumentally. Then Jess heard one of our tapes and was like, "I really like this." So we were jamming along and she started singing some lyrics from a book, and—I really hate to say it, but I will anyway—it was magic. Our first show we were doing this song about shoes and Jess just started taking the shoes off audience members. I was like, "So this is the kind of band this is. All right!" With the costumes—Jess makes those. She is definitely not interested in creating a façade. If it's made out of toilet paper tubes, you're going to know it's made out of toilet paper tubes. Our music is very much collage, and the costumes are like that as well. It's junk collage. Describe Fat Worm of Error's theory on making music. Sometimes if it goes up in the right places and down in the right places, it's allright. We reference Ornette Coleman's harmolodic theory a lot. The general idea that the song is created by the interrelationship of the parts, the direction that an individual string player's parts might move up or down, but not necessarily a direct relationship. And if we hit upon something then we can work with that. And if we don't, we still feel like there's this evolving line. Another thing I draw reference to is a lot of heterophonic music of Southeast Asia, where you'll have two to five instruments playing essentially the same line. The musicians are all swooping in and out doing their own thing, but they are all referencing the same pitch idea at the same time, they are all coming at it in different ways. Sometimes we focus on making what we're playing individually the best you can, and that's not always hitting the perfect intonation at the perfect time. It certainly is for certain kinds of music, but that's not a universal. I mean, plenty of good guitar solos are filled with bad notes. Sometimes it just sounds good. I really feel like the perfection that Western music in general subscribes to, I don't think it's worthless in the slightest, I just don't think it's the only thing. ?